K-State’s Agricultural Communicator’s of Tomorrow (ACT) chapter is hosting its first Critique and Contest for Kansas high school students interested in photography, writing, and design. 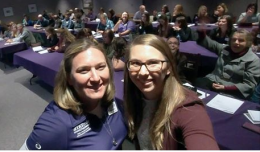 The chapter is asking for ACJ alumni to help support the program through donations that would provide an award to the winners of each category to support their studies at K-State. Awards are planned to be $100 for each overall winner of the categories, which are open to all ages in high school. The contest will be opened from January until March. Winners will be announced following spring break. For more information regarding sponsoring, please contact Audrey King at audreyking@ksu.edu. Beth Gaines, executive director of the Kansas FFA Foundation, experienced a change of heart her junior year of college. This occurrence was frightening at first, but allowed her to realize her true passion and started her on the track toward her current career. “Follow your heart and your passions, they will take you where you need to go,” Gaines says. Throughout her childhood and early college years, Gaines was solely interested in utilizing her Kansas State degree (’91) in agricultural communications and journalism for radio broadcasting. “As a junior in college, I had an internship with a radio company and realized very quickly that was not what I wanted,” Gaines says. Getting an opportunity to experience the reality of working in the radio industry allowed her to gain new insight and understand what to expect from a career in broadcasting. Although the internship caused her to drift from her original plan, it led her to her true passion within agricultural communications. 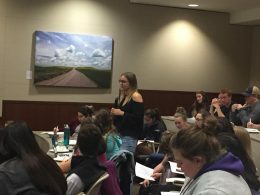 Communications and Agricultural Education students joined others across the College of Agriculture to discuss why diversity matters in the college. This student-led forum was standing-room-only in the Leadership Studies’ Town Hall. The crowd included Dean John Floros, assistant and associate deans, department chairs, and faculty. Industry partners were also present like Kansas Farm Bureau, Kansas Department of Agriculture, Cargill, and other stakeholders. ACJ student, Bryanna Cook speaks up during college-wide diversity forum. Two ACJ students, Bryanna Cook and Kyler Langvardt, were brave enough to speak out against hate and stand up for inclusion.